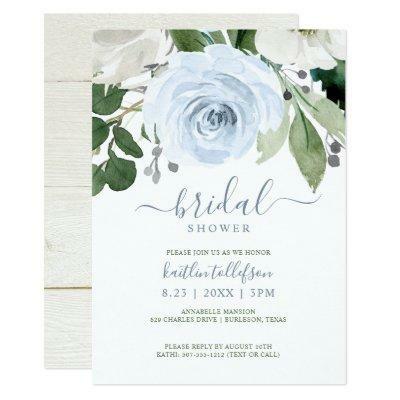 Watercolor Bridal Bouquet Bridal Shower Invitations (Dusty Blue): These botanical bridal shower invitations are perfect any color bridal shower! With big dusty blue florals and eucalyptus greenery, the bride and your guests are sure to love it! The back features a rustic barn wood design. Change your text to make it your own. You can also change your text color and background color!